Emirates Airline is to continue its support of Emirates Team New Zealand. President of Emirates airline, Sir Tim Clark, said the airline’s decision was recognition of the success of the team in helping build the Emirates brand globally, as well as signalling further commitment to New Zealand. “Emirates started its New Zealand services in 2003 and has been naming rights sponsor of Team New Zealand since 2004,” he said. “Our re-commitment for the next America’s Cup challenge, lodged by the Royal New Zealand Yacht Squadron in August last year, is testament to the spirit, skill and strengths the team has shown. “There is also no doubt that our continued support is reflective of the success the team has been in allowing us to get closer to our loyal and potential customers in New Zealand and many other countries and in building awareness of Emirates as a leading global brand. Emirates Team New Zealand chief executive Grant Dalton said the response to securing funding for the challenge had been encouraging: “We have made considerable progress because the Emirates Team New Zealand brand is an international leader, well recognised in the sport. Emirates airline has been with the team since 2004 and their decision to stay with us is important. We are fortunate to have such loyal and committed sponsors." 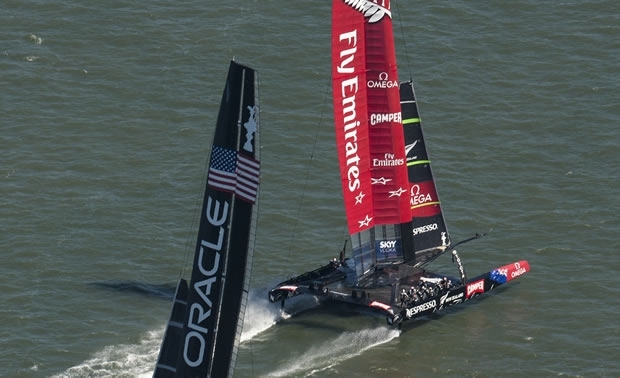 Dalton paid tribute to the many sponsors and suppliers – including Emirates - who have stood by the team in the hard times since the end of the 34th America’s Cup in 2013. Sir Tim Clark added: “Exposure for Emirates through the team and its global reach has helped put the airline on the map in many parts of the world and with many audiences. We hope there is now the chance of building further on this excellent foundation. Emirates flies three A380 services daily from Auckland to Dubai and beyond via Australia, as well as offering a daily Boeing 777-300ER service from Christchurch.